Nokia Networks demonstrated LTE-Advanced (LTE-A) carrier aggregation in small cells delivering a peak data rate of more than 200 Mbps. 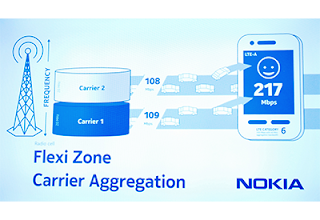 The demo, which was conducted at a Nokia lab in Arlington Heights, Illinois, showed small cell LTE-A intra-site carrier aggregation. The test aggregated 2 x 20 MHz of TD-LTE using a TD-LTE capable Category 6 device resulting in a throughput approaching 220 Mbps. Nokia said this testing demonstrated that the performance of its Flexi Zone small cells can be doubled using a single micro or pico base station.